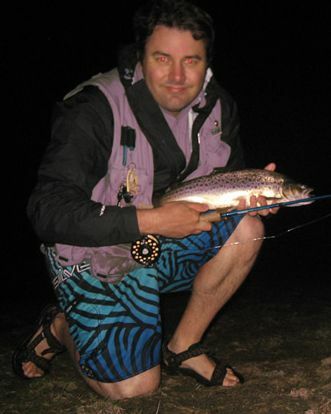 The hot weather has made a little change to the fishing but there have still been some very nice reports coming in from Lake Eucumbene and also from the rivers. *Hey Tom, Had a reasonable session on the Eucumbene river over the weekend. Lots of little rainbows coming to dry flies, and lots of little browns coming to nymphs.Caught and released this little beauty, but not before he had his photo taken. *Super keen local angler Stuart Sturgeon hit the Eucumbene river also this week and said there were plenty of fish rising to the dry. 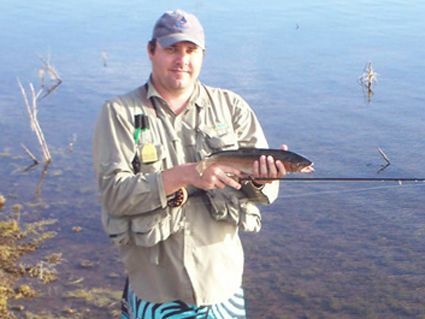 He landed fish to nearly 1kg with a mixture of both brown and rainbows. All were released. 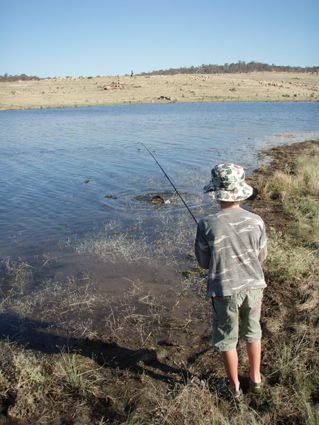 Lake Eucumbene:- The lake is still fishing well though it has tapered off a little. We have had some very good reports despite the hot weather but if you don't find them you won't catch them. If you stand in the one spot flogging away you might catch a fish, but if you move and cover more ground you will give yourself a better chance of catching more. Mudeyes have been quiet but the next two weeks should see a few more hatching. Night fishing has been better than past weeks and should be good for a time yet. 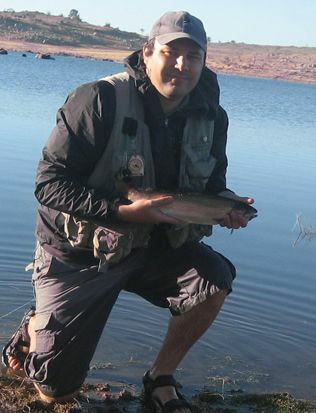 Please find attached some pics of some of the better fish I caught over the time I was down. Got one nice Brown (50cm around 3lb) that took a hopper just on dark, I also took some very good rainbows all around 45cm and full of fight! I had a few good sessions on the hoppers and also mudeye patterns on dusk. Didnt have much luck on the black bead head just the one fish that afternoon fishing with Tom. Best wet for me was a Mrs Simpson either on dusk or in the morning it seemed to be the most consitent fly picked up the most hookups, although I did leave a couple of fish wearing them. A word of warning for the summer board short wearers, I ran into a small brown snake (1.2m) over on the point on the north side of Rushy Plains while trying to work out some very big browns that had been cruising amoung the trees, they proved very tricky even refusing after closely inspecting a real hopper I chucked out to get them in the mood. It was hard to pack up and head back up to <?xml:namespace prefix = st1 ns = "urn:schemas-microsoft-com:office:smarttags" />Sydney as Lake surface was completely covered in hoppers last Sunday (18th). *Mick Couvee had a very good morning in the Buckenderra arm this morning. He found a good number of fish cruising and tailing in the shallows on first light. Four fish were landed in the 40-45cm range from ten shots at the cruisers. A brown nymph under a dry was the best method. 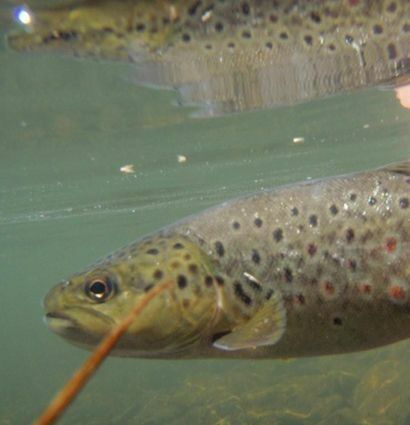 Of the fish kept they had large amounts of stick caddis in their stomachs. Certainly not too hot for the fish early in the day it seems. Something to add to your newsletter - drew a blank last weekend (18th) - must have been getting to the lake at 6:00 am with the temperature at 4 degrees - but tried everything both sides of the bay at Rushy Plains (walked right round to the yellow marker on the Buckenderra reach fishing all the way and almost the same distance on the Frying Pan side) and fished till around 3:00 pm. Great hatch - plenty of feed on and in the water. Fished it deep with both weighted and unweighted nymphs - cleaned enough grass off them to know I was hitting the bottom - and tried a variety of streamer patterns (Woolly Buggers, Mrs Simpson, Hamills Killer, Taihape Tickler) in the deeper spots and near the timber on the banks of the island towards Frying Pan - but couldn't get a touch. Only saw three fish moving out wider and nothing close in with the polaroids on. From the quiet and disappointed looks from the others out there, the story was the same all round. But what a difference a weekend makes. Went out last night (Monday) - got to Rushy Plains around 5:00 pm - walked towards the Buckenderra side to find some sheltered bays. Water had dropped a little - again, fantastic hatch of flies and pretty quiet to start. First fish around 7:30 on a mudeye pattern - a rainbow around 35cm - no rise, but just slowly fished around some reeds - was full of snails, nymphs and a couple of mudeyes. Second about 8:00 - a twin of the first. Then 8:15 for number 3 - a beautiful 45 cm fish. 8:25 had a steam train of a fish bust me off about 10 m into the backing - just kept taking line and accelerating straight out - 2kg tip couldn't hold it as I leant back on the rod to try & slow it a little - beaded black nymph gone down the throat of what was probably a decent sized brown. 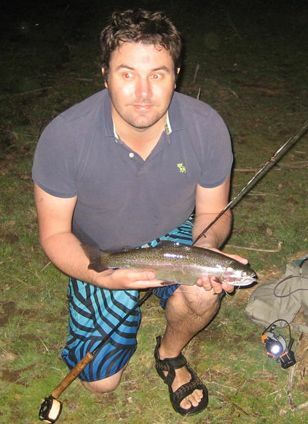 Was getting darker, so I swapped over to a Taihape Tickler - 8:45 saw fish number 4 - a 40 cm rainbow and 9:00 got the fifth - 45 cm rainbow with a ton of fight, and in better shape than the earlier one. Plenty of touches in between the last 3 fish as well and they started to rise while I was retying after the bust off - but pulled up stumps at that stage - figured having a full bag added to a 25 minute walk, then load the car to drive back to Canberra before work today was a good enough effort. There was one other group on the Frying Pan side of the bay  could hear them talking, but didnt hear much excitement in their voices. Lake Jindabyne:- No Reports from Jindabyne this week but there should be some good nightime fishing around this moon phase. All types of methods have worked with downrigging, and lead core being a better option for the hot, bright parts of the day. 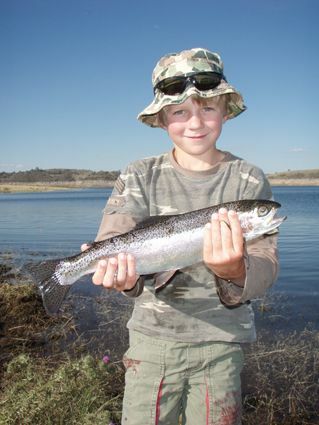 *Ethan Hunt had a great school holidays and here is another great rainbow he caught in the first five minutes on his last outing. Mario's Snowy Minnow was the lure used. Dad and Mr Baxter might have even copped a flogging over that fact that he had caught one before we had even rigged up. Again, well done Ethan. 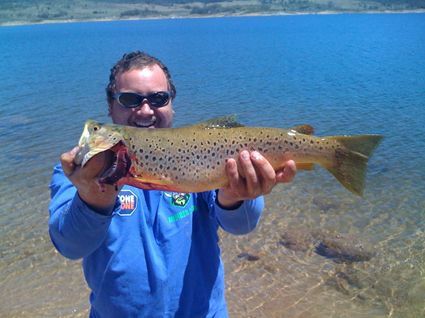 Jindabyne:- Jindabyne trolling reports have been very good with one group catching several browns in the 2.5kg bracket. Trolling down deep in the 40-50 mark was the best method. 2.3kg and length 53cm. Caught at kalkite.